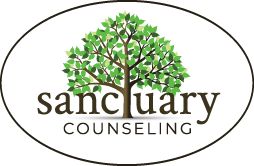 Tag: meditation | Sanctuary Counseling, LLC. I found my way to practicing mindfulness over seven years ago. Sometimes when we are desperate to feel better we are willing to try anything once. I started with a beginner yoga class. It wasn’t easy but I was committed to learning how to better manage my anxiety. After several years of yoga practice, life became pretty busy and I didn’t have the time to consistently make the expensive and lengthy instructor led classes and began searching for other ways to continue to breathe, meditate and be mindful. That led me to try short meditations at home and guided audio meditations before bed. I was relentless in my search of ways to stay connected to my breath, which is so important in the management of anxiety. Some days all I have time for is ten minutes of listening to some relaxation music after work. Other days I might listen to a guided meditation on my lunch break, take a mindful walk during a quick work break or simply stop and admire the blooming spring flowers or the fall foliage. Mindfulness is so easy to access anytime and it’s something you can do for free! So what is Mindfulness anyway? And how does it help manage anxiety? Mindfulness is the practice of purposely focusing your attention on the present moment—and accepting it without judgment. Mindfulness in now being examined scientifically and has been found to be a key element in happiness. When we rush around each day we often get swept up in the energy of doing and accomplishing more. The more plugged in we are to technology the more we need to balance ourselves. 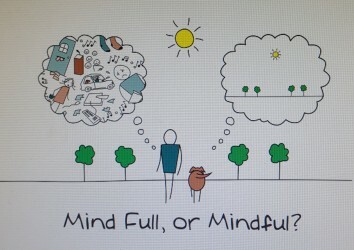 Mindfulness is a perfect tool for clearing our over-stimulated minds, reconnecting to the physical sensations in the body and acknowledging feelings. I often work with clients who are not sure how to turn their brains off or get to sleep at night. Mindfulness practice might be a good place to start to make small changes to manage your physical and mental health. There are many ways to begin using mindfulness tools in your everyday life. Click here for more meditation and mindfulness resources.